Bret Hart and Jim Neidhart signed with the WWF as part of the deal with Vince McMahon buying Stampede Wrestling. April 2, 1986 – WrestleMania II: Bret and Jim were the last two people eliminated in a Battle Royal, tossed over by Andre The Giant. September 6, 1986 – Superstars: The Hart Foundation (Bret Hart and Jim Neidhart) defeated Koko B. Ware and Paul Roma. September 21, 1986 – Wrestling Challenge: The Hart Foundation (Bret Hart and Jim Neidhart) vs. The Islanders (King Tonga and Tonga Kid) ended in a double disqualification. October 12, 1986 – Wrestling Challenge: The Hart Foundation (Bret Hart and Jim Neidhart) defeated Mario Mancini and Nick Kiniski. November 15, 1986 – Superstars: The Hart Foundation (Bret Hart and Jim Neidhart) defeated Johnny Mann and Sivi Afi. November 23, 1986 – Wrestling Challenge: The Hart Foundation (Bret Hart and Jim Neidhart) defeated The Moondogs (Moondog Rex and Moondog Spike). November 29, 1986 – SNME: The Killers Bees (Brian Blair and Jim Brunzell) defeated The Hart Foundation. November 29, 1986 – Superstars: The Hart Foundation (Bret Hart & Jim Neidhart) defeated The British Bulldogs (Davey Boy Smith & The Dynamite Kid). December 7, 1986 – Wrestling Challenge: The Hart Foundation (Bret Hart and Jim Neidhart) defeated Bob Boyer and Salvatore Bellomo. December 28, 1986 – Wrestling Challenge: Adrian Adonis & The Hart Foundation (Bret Hart & Jim Neidhart) defeated SD Jones & The American Express (Danny Spivey & Mike Rotundo). January 24, 1987 – Superstars: The Hart Foundation (Bret Hart and Jim Neidhart) defeated Scott McGhee and Tony Garea. January 26, 1987 – Superstars: The Hart Foundation defeated The British Bulldogs for the Tag Team titles. February 1, 1987 – Wrestling Challenge: Adrian Adonis & The Hart Foundation (Bret Hart & Jim Neidhart) defeated Jim Parks, Paul Roma & Tony Garea. 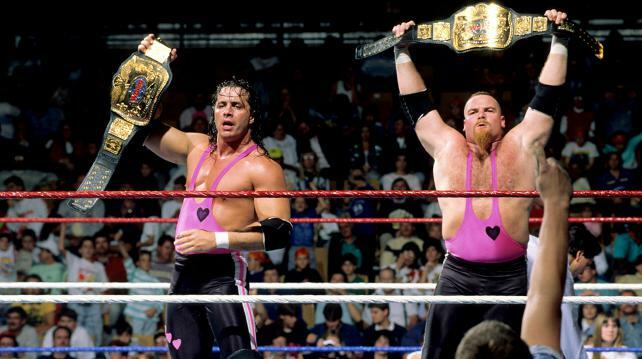 March 1, 1987 – Wrestling Challenge: Tag team champions The Hart Foundation (Bret Hart and Jim Neidhart) defeated Lanny Poffo and SD Jones to retain. March 7, 1987 – Superstars: Tag team champions The Hart Foundation (Bret Hart and Jim Neidhart) defeated Jerry Allen and Jim Powers to retain. March 14, 1987 – SNME: The Hart Foundation defeated Tito Santana and Danny Spivey to retain the Tag Team titles. March 22, 1987 – Wrestling Challenge: The Hart Foundation (Bret Hart and Jim Neidhart) defeated Jim Powers and Paul Roma. March 27, 1987 – WrestleMania III: The Hart Foundation and Danny Davis defeated The British Bulldogs and Tito Santana. March 28, 1987 – Superstars: Tag team champions The Hart Foundation (Bret Hart and Jim Neidhart) defeated Joe Mirto and Rick Hunter to retain. April 11, 1987 – Superstars: The Hart Foundation (Bret Hart and Jim Neidhart) defeated Rick Hunter and SD Jones. April 26, 1987 – Wrestling Challenge: Tag team champions The Hart Foundation (Bret Hart and Jim Neidhart) defeated Joe Mirto and Nick Kiniski to retain. May 17, 1987 – Wrestling Challenge: The Hart Foundation (Bret Hart and Jim Neidhart) defeated Jack Miller and Joe Mirto. July 12, 1987 – Wrestling Challenge: Tag team champions The Hart Foundation (Bret Hart & Jim Neidhart) defeated Corporal Kirchner & Omar Atlas to retain. July 18, 1987 – Superstars: Tag team champions The Hart Foundation (Bret Hart and Jim Neidhart) defeated Jerry Allen and Mike Richards to retain. August 2, 1987 – Wrestling Challenge: The Hart Foundation (Bret Hart and Jim Neidhart) defeated SD Jones and Sivi Afi. August 8, 1987 – Superstars: The Young Stallions (Jim Powers and Paul Roma) defeated The Hart Foundation (Bret Hart and Jim Neidhart) by disqualification. September 26, 1987 – Superstars: Tag team champions he Hart Foundation (Bret Hart and Jim Neidhart) defeated SD Jones and Sonny Rogers to retain. October 3, 1987 – SNME: The Hart Foundation defeated The Young Stallions (Paul Roma and Jim Powers) to retain. October 27, 1987: Strike Force (Rick Martel and Tito Santana) defeated the Hart Foundation for the tag team titles. November 26, 1987 – Survivor Series: Strike Force (Rick Martel & Tito Santana), The British Bulldogs (Davey Boy Smith & The Dynamite Kid), The Killer Bees (B. Brian Blair & Jim Brunzell), The Rougeau Brothers (Jacques Rougeau & Raymond Rougeau) & The Young Stallions (Jim Powers & Paul Roma) defeated Demolition (Ax & Smash), The Bolsheviks (Boris Zhukov & Nikolai Volkoff), The Dream Team (Dino Bravo & Greg Valentine), The Hart Foundation (Bret Hart & Jim Neidhart) & The Islanders (Haku & Tama) in a 10 man tag team elimination match. November 28, 1987 – Superstars: The Hart Foundation (Bret Hart and Jim Neidhart) defeated Jerry Allen and Lanny Poffo. November 28, 1987 – SNME: Randy “Macho Man” Savage defeated Bret “Hitman” Hart. December 6, 1987 – Wrestling Challenge: The Hart Foundation (Bret Hart and Jim Neidhart) defeated Scott Casey and Sivi Afi. December 19, 1987 – Superstars: The Hart Foundation (Bret Hart and Jim Neidhart) defeated Omar Atlas and Outback Jack. January 10, 1988 – Wrestling Challenge: The Hart Foundation (Bret Hart, Danny Davis and Jim Neidhart) defeated Doug Wellington, Sivi Afi and Steve Lombardi. January 23, 1988 – Superstars: The Hart Foundation (Bret Hart, Danny Davis and Jim Neidhart) defeated Rex King, Sam Houston and Van Van Horne. January 24, 1988 – Royal Rumble: In the first ever Rumble match, Bret enters in the #1 spot, but is eliminated by Jim Duggan. January 31, 1988 – Wrestling Challenge: The Hart Foundation (Bret Hart and Jim Neidhart) defeated Omar Atlas and SD Jones. February 5, 1988 – SNME: Strike Force (Santana and Martel) defeated The Hart Foundation to retain the tag team titles. March 27, 1988 – WrestleMania IV: Bret Hart is the last wrestler to be eliminated by Bad News Brown in a Battle Royal. ~~~Bret Hart and Bad News Brown initially agreed to split the prize, but Bad News turned on him, which started Hart’s face turn. July 2, 1988 – Superstars: The Hart Foundation (Bret Hart and Jim Neidhart) defeated Brady Boone and SD Jones. July 10, 1988 – Wrestling Challenge: The Hart Foundation (Bret Hart and Jim Neidhart) defeated Scott Colontonio and Tommy Ulysses. July 31, 1988 – WrestleFest: Bad News Brown defeated Bret “Hitman” Hart. July 31, 1988 – Wrestling Challenge: The Hart Foundation (Bret Hart and Jim Neidhart) defeated Harley Manson and Rick Gantner. August 6, 1988 – Superstars: The Hart Foundation (Bret Hart and Jim Neidhart) defeated Chris Curtis and Tom Stone. August 21, 1988 – Wrestling Challenge: The Hart Foundation (Bret Hart and Jim Neidhart) defeated Al Kirkland and Bob Bryant. August 27, 1988 – Superstars: The Hart Foundation (Bret Hart & Jim Neidhart) defeated Los Conquistadores (Conquistador Dos & Conquistador Uno). August 28, 1988 – SummerSlam: Demolition (Ax and Smash) defeated The Hart Foundation to retain the tag team titles. October 2, 1988 – Wrestling Challenge: The Hart Foundation (Bret Hart and Jim Neidhart) defeated Gene Ligon and Tony Suber. October 15, 1988 – Superstars: The Hart Foundation (Bret Hart and Jim Neidhart) defeated Rick Gantner and Tom Stone. October 29, 1988 – SNME: Demolition (Ax and Smash) defeated The Hart Foundation to retain the tag team titles. 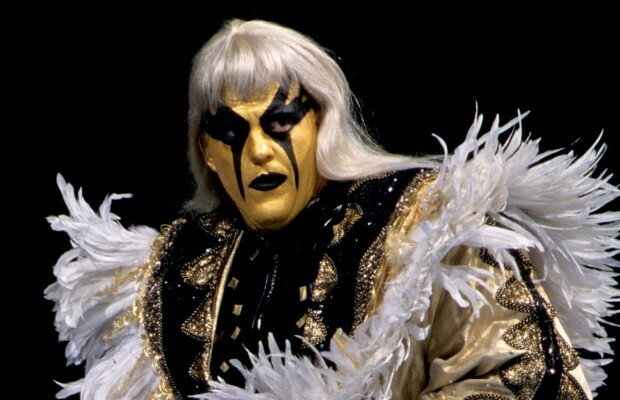 November 13, 1988 – Wrestling Challenge: Bret Hart vs. Greg Valentine ended in a double count-out. November 19, 1988 – Superstars: The Hart Foundation (Bret Hart and Jim Neidhart) defeated John Ziegler and Larry Stephens. November 24, 1988 – Survivor Series: The British Bulldogs (Davey Boy Smith & The Dynamite Kid), The Hart Foundation (Bret Hart & Jim Neidhart), The Powers Of Pain (The Barbarian & The Warlord), The Rockers (Marty Jannetty & Shawn Michaels) & The Young Stallions (Jim Powers & Paul Roma) defeated Demolition (Ax & Smash), The Bolsheviks (Boris Zhukov & Nikolai Volkoff), The Brain Busters (Arn Anderson & Tully Blanchard), Los Conquistadores (Conquistador Dos & Conquistador Uno) & The Fabulous Rougeaus (Jacques Rougeau & Raymond Rougeau) in a 10 team tag team elimination match. December 3, 1988 – Superstars: The Hart Foundation (Bret Hart and Jim Neidhart) defeated Barry Horowitz and Iron Mike Sharpe. January 7, 1989 – Superstars: The Hart Foundation (Bret Hart and Jim Neidhart) defeated Rhythm And Blues (Greg Valentine and The Honky Tonk Man) by disqualification. January 15, 1989 – Royal Rumble: Jim Duggan and The Hart Foundation beat Dino Bravo and The Rougeau Brothers. March 4, 1989 – Superstars: The Hart Foundation (Bret Hart and Jim Neidhart) defeated Gary Wolfe and Tony Durante. March 26, 1989 – Wrestling Challenge: The Hart Foundation (Bret Hart and Jim Neidhart) defeated Dusty Wolfe and Iron Mike Sharpe. April 2, 1989 – WrestleMania V: The Hart Foundation defeated the Honky Tonk Man and Greg Valentine. July 1, 1989 – Superstars: The Hart Foundation (Bret Hart and Jim Neidhart) defeated Brian Costello and Ray Oakley. July 9, 1989 – Wrestling Challenge: The Hart Foundation (Bret Hart and Jim Neidhart) defeated Boris Zhukov and Jake Milliman. July 29, 1989 – Superstars: The Hart Foundation (Bret Hart and Jim Neidhart) defeated Barry Horowitz and Dave Coleman. August 13, 1989 – Wrestling Challenge: Bret Hart and Jim Neidhart defeated Kim Arnold and Mike Scarberry. August 19, 1989 – Superstars: Bret Hart and Jim Neidhart defeated Bill Spector and Mitch Casey. August 27, 1989 – Wrestling Challenge: Bret Hart and Jim Neidhart defeated Tom Stone and Jake Milliman. August 28, 1989 – SummerSlam: The Brain Busters (champions) defeated The Hart Foundation. September 24, 1989 – Wrestling Challenge: Bret Hart and Jim Neidhart defeated Don Champ and Tony Ulysses. November 23, 1989 – Survivor Series: Bret Hart and Jim Neidhart were booked on two separate Survivor Series teams. December 9, 1989 – Superstars: Bret Hart and Jim Neidhart defeated Al Burke and Brad Perry. 1990 – WWF/AJPW Show: Tiger Mask (Mitsuharu Misawa) wrestled Bret Hart to a 20-minute time limit draw! March 18, 1990 – Wrestling Challenge: Bret Hart and Jim Neidhart defeated The Black Knight and Iron Mike Sharpe. April 1, 1990 – WrestleMania VI: The Hart Foundation defeated the Bolshevics in 19 Seconds. April 7, 1990 – Superstars: Bret Hart and Jim Neidhart defeated Buddy Rose and Mark Ming. April 22, 1990 – Wrestling Challenge: Bret Hart and Jim Neidhart defeated Al Polic and Black Bart. April 28, 1990 – Superstars: Bret Hart and Jim Neidhart defeated Pez Whatley and Bob Bradley. May 6, 1990 – Wrestling Challenge: Bret Hart and Jim Neidhart defeated Boris Zhukov and Nikolai Volkoff. June 3, 1990 – Wrestling Challenge: Bret Hart and Jim Neidhart defeated Tom Bennett and Tom Stone. June 9, 1990 – Superstars: Bret Hart and Jim Neidhart defeated The Brooklyn Brawler and The Blue Terror. August 5, 1990 – Wrestling Challenge: Bret Hart and Jim Neidhart defeated Black Bart and Greg Jovan. August 18, 1990 – Superstars: Bret Hart and Jim Neidhart defeated Al Burke and Tom Stone. August 26, 1990 – Wrestling Challenge: Bret Hart and Jim Neidhart defeated Chris Duffy and Barry O.
August 27, 1990 – SummerSlam: The Hart Foundation defeated Demolition to recapture the tag team titles. September 15, 1990 – Superstars: Tag team champions Bret Hart and Jim Neidhart defeated Paul Perez and The Brooklyn Brawler to retain the titles. September 30, 1990 – Wrestling Challenge: Bret Hart and Jim Neidhart defeated Buddy Rose and Pez Whatley. October 6, 1990 – Superstars: Tag team champions Bret Hart and Jim Neidhart defeated Bob Bradley and Tom Burton to retain the titles. October 21, 1990 – Wrestling Challenge: Tag team champions Bret Hart and Jim Neidhart defeated Alan Reynolds and Randy Jackson to retain the titles. November 22, 1990 – Survivor Series: The Million Dollar Team (Greg Valentine, Ted DiBiase, The Honky Tonk Man & The Undertaker) defeated The Dream Team (Bret Hart, Dusty Rhodes, Jim Neidhart & Koko B. Ware) in a tag team elimination match. December 9, 1990 – Wrestling Challenge: Tag team champions Bret Hart and Jim Neidhart defeated Barry Hardy and Paul Perez to retain the titles. December 22, 1990 – Superstars: Tag team champions Bret Hart and Jim Neidhart defeated Black Bart and The Black Demon to retain the titles. January 6, 1991 – Wrestling Challenge: Tag team champions Bret Hart and Jim Neidhart defeated Bob Bradley and Tom Bennett to retain the titles. January 19, 1991 – Superstars: Bret Hart and Jim Neidhart defeated Black Bart and JT Jones. January 19, 1991 – Royal Rumble: For the 2nd time, Bret Hart entered at #1 in the Rumble, but is eliminated by The Undertaker. March 9, 1991 – Superstars: Bret Hart and Jim Neidhart defeated John Martin and Pete Sanchez. Bret Hart and Jim Neidhart were reunited in 1997 when Bret Hart formed a Hart Foundation faction. The Hart Foundation are widely considered one of the greatest team to step foot inside a wrestling ring. August 14, 2004 – Ballpark Brawl: Jim Neidhart beat Johnny Puma | Included Hart Foundation reunion with Bret Hart and Jimmy Hart. July 22, 2005 – Border City Wrestling: They had a Hart Foundation Reunion with Jimmy Hart, Jim Neidhart, and Bret Hart. April 6, 2019: The Hart Foundation (Bret Hart and Jim Neidhart) were inducted in the 2019 class of the WWE Hall Of Fame.